Platinum-selling strings that’ll satisfy your tone obsession. 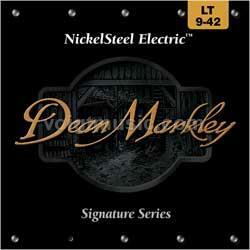 Sporting a new look, our NickelSteel ElectricTM strings are the cornerstone of Dean Markley. They’re used and loved by thousands of pros worldwide, and they have been for decades. Tried and true, with long-lasting tone. With nickel-plated steel hand-wound slowly over a hex core, the outer string wrap maintains100% contact with the core. The result? A string that vibrates completely for maximum sustain, creating a warm, full sound distinctive of classic rock and roll. The core-to-wrap ratio makes bending easier than other strings, too. There’s a reason we’ve put our signature on â€˜em. These strings sound and feel like home!